What data is available on the platform ? 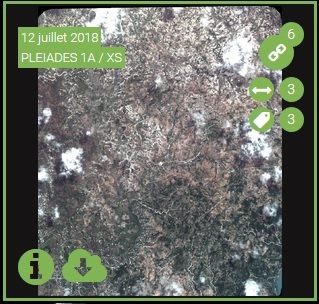 The plateform makes available satellite data of different sensors from project's partners (list available here) but also different products generated during the project. The list of products can be consulted on the "Accès aux données" tab of the top navigation bar. Three ways to find products : by searching directly on map, displaying the latest published data, or by doing a direct search on the database. How to download products ? The products available are each associated with a license, different according to the type of product. This is why downloading products requires the creation of an account. A pop-up will open, informing you of the license associated with the product you require, once accepted the download will start automatically. How to see the links between products ? A click on the chain at the top right opens the links menu and thus shows the types of links that exist with this image. A click on the link numbers opens the window describing links and related products. In the list of product-related metadata, the "Existing links" section in the right-hand column under "Documentation" displays the first ten links with the sorted image in the following way: the acquisition links, native, of production then not native. The table visible on the product page is also available in the visible metadata when you click on the "i" in map viewing mode. You must go to this link to create an account. Once the form has been sent, the RO team (us) has yet to validate your account. Indeed this verification is necessary in regard to partners offering free access to the data. How to quickly find the products of a theme ? Thematic products are accessible and sorted according to their themes in the Dashboard "communauties". This dashboard lists all the themes and projects of the site Recovery Observatory but also the latest news from both satellite images but also products, events but also the project activities. We didn't answer your question ? Don't hesitate to contact us via this link, we will be pleased to inform you.